2:30 p.m. and 5:00 p.m. The Nutcracker, a classic Christmas story presented in two acts, is a fairy tale ballet centered on the Stahlbaum's Christmas Eve celebration. Family and friends have gathered in the parlor to decorate the beautiful Christmas tree in preparation for the party. Once the tree is finished, the children are sent for. They stand in awe of the tree sparkling with candles and decorations. Drosselmeyer, a local toymaker and magician who is also the Godfather to the Stahlbaum children, delights all of the children with gifts, magic, and a story. Clara receives a special Nutcracker, which is broken by her jelous brother, Fritz. After the guests have all left, Clara falls asleep by the Christmas tree with her beloved Nutcracker. Magically, The Nutcracker comes to life in her dreams. Clara watches The Nutcracker, along with his soldiers, battle the Mouse King and mice. Nearly defeated, Clara saves The Nutcracker by throwing her slipper at the Mouse King. The Nutcracker is transformed into a prince, then leads Clara through the moonlit night to a pine forest. Snowflakes dance around them, beckoning them on to The Prince's kingdom as the first act ends. In Act II, Clara and The Prince travel to the beautiful Land of Sweets, ruled by the Sugar Plum Fairy. They are presentd with a celebration of sweets from around the world — chocolate from Spain, coffee from Arabia, tea from China, and candy canes from Russia. Beautiful flowers perform a waltz. To conclude the night, the Sugar Plum Fairy performs a delightful dance before The Prince bows to Clara and kisses her goodnight. 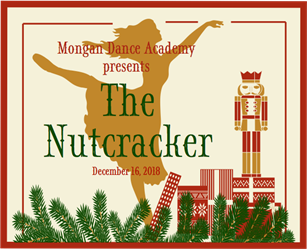 The Nutcracker is presented by Mongan Dance Academy's ballet students in Pre-Ballet III and Ballet I, II, and III. Each ballet class performs a group dance. Students in Ballet I, II, and III are eligible to audition for special roles, such as Clara, Nutcracker, Drosselmeyer, Sugar Plum Fairy and more. MDA staff are looking for dancers to perform solo roles or to be in small group dances. Dancers should be experienced, hard working, and demonstrate keen performance abilities. We want skilled dancers with strong stage presence to play special roles, such as Clara, Nutcracker, Drosselmeyer, Sugar Plum Fairy and more. Auditions will consist of a shortened ballet class and repertoire. Students auditioning for special parts will perform a select piece from The Nutcracker in pairs for the judges and other students. All students should arrive on time and in their class uniforms. They are to submit the completed Nutcracker Audition Form prior to or on the evening of the audition. Must be in Ballet I, II, or III. Must be enrolled in both the Fall and Winter Sessions. Must be available for several Friday evening rehearsals. Each role and small group will have specific rehearsal dates. These students should expect four rehearsals beginning September 22 until the show. Rehearsals will run from 5:00-7:00 p.m. Rehearsal dates and times will be determined and assigned upon acceptance of roles. Students must complete The Nutcracker Participation Form and return it to MDA by Saturday, September 22, 2018 so MDA can finalize plans and begin choreography. Ticket Pre-Sales for reserved seating will begin on Sunday, November 4 through 10. Each student is allowed to purchase 12 tickets during presales which can be used at one show or a combination of the two shows. General Ticket Sales will begin on Sunday, November 11. Unlimited additional tickets may be purchased at that time. Advanced tickets can be ordered online or at the studio. Tickets must be paid in full at the time of purchase. Tickets will be distributed the first week of December. All seats are reserved. All sales are final. No refunds. Say It with Flowers! Tell your special dancers how much you appreciate their hard work, commitment, and passion for the artistry of dance as they present The Nutcracker. These beautiul Christmas bouquets consisting of red roses, baby's breath, and Christmas greenery are purchased locally from Mariano's in Evergreen Park. The bouquets will be available for pick-up in the auditorium lobby the day of the performance. Cost: $15 each. The Nutcracker will be videotaped by a professional videographer. DVD's can be pre-ordered or ordered after the show. 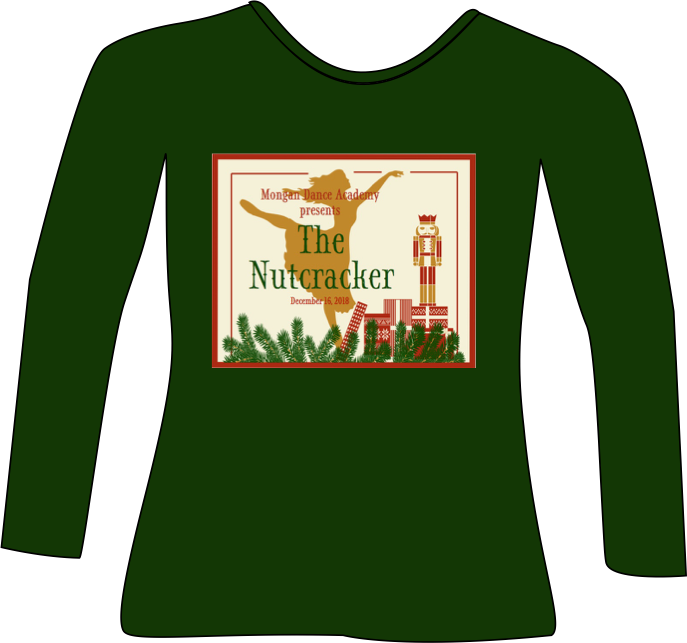 This long-sleeved shirt depicts the gifts delivered to the Christmas Eve celebration, including The Nutcracker presented to Clara by Godfather Drosselmeyer. The names of all cast members will be printed on the back.